Sometimes you walk into an exhibition and the stuff hits you over the head. Sometimes you walk in and it takes a while to sink in. 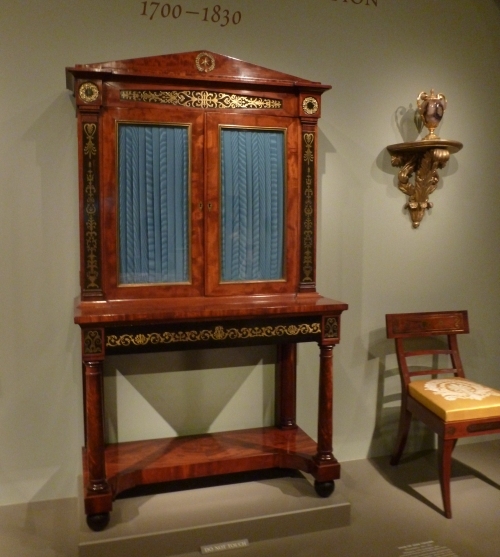 The new furniture rooms that are part of the Kaufman Collection at the National Gallery of Art in DC are a case in point. 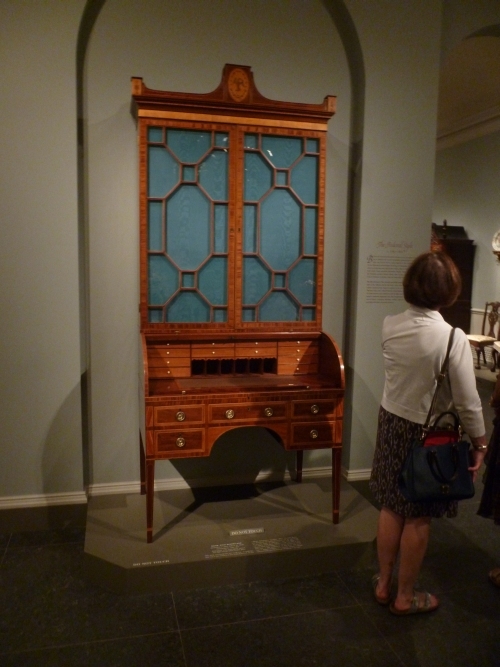 I walked into a seemingly random selection of early American furniture and it took a walk through and back before I realized the brilliance of the exhibition. 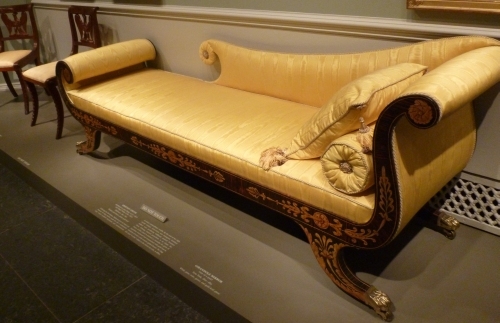 What the museum did was take representative pieces from four eras in American furniture design; Queen Anne, Chippendale, Federal, and Empire and set each style up in a room to give the visitor a visceral understanding of the differences in style and decoration. In a nutshell: Queen Anne - pretty elegant but simple forms. 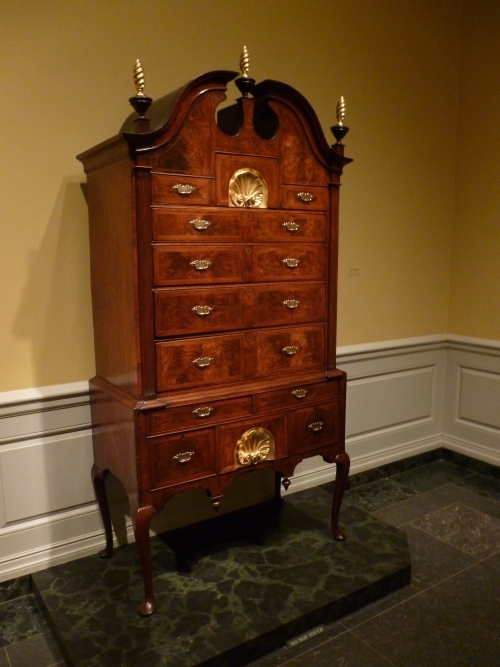 Chippendale - take Queen Anne and add fancy decorations and carvings. Federal - severe, squared off, remove the Chippendale surface carvings but keep simplified inlays and veneering. Empire - take Federal shapes and gussy them up. 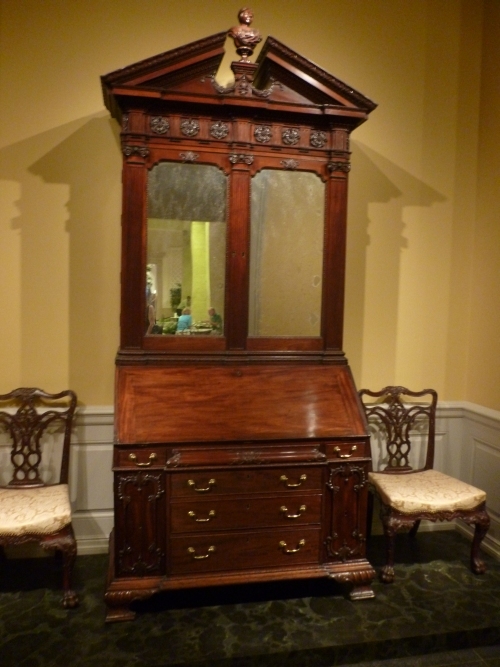 By going from room to room you can see how the styles evolved and impacted dressers, chairs, and desks. 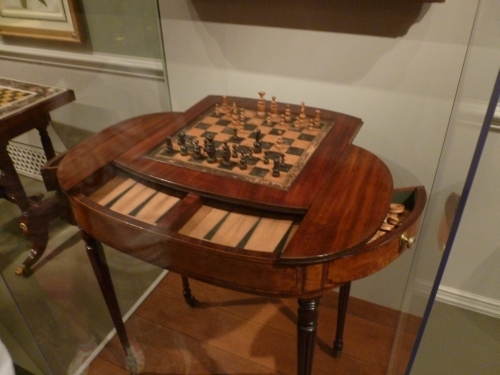 My favorite piece was a gaming table probably by Seymour, but the whole show, by having a context, had me going back and forth between the rooms many times. In other parts of the National Gallery they have interesting furniture scattered around the paintings. Some of it is quite wonderful. However the Kaufman exhibit, which isn't huge, only three or four rooms, really made the difference because it had a story, a message, I learned a lot, it wasn't just nicely displayed stuff. If you are in DC do not miss it. The best book I know of for learning about furniture designs is Identifying American Furniture. The book, a recent addition to our store, is basically a paint-by-numbers guide to the essence of the different styles of American furniture from colonial to modern times. By understanding the vocabulary of design style you will be able to design and express yourself better when you design your own furniture. I highly recommend it. The summer recall of Festool's TS55 REQ saw is over and you can place your pre-order now for shipment on October 23rd. The TS-55 is the most popular of the Festool saws, and we are glad to see it back. If you have a TS55 please contact your dealer or Festool USA to arrange a return trip and repair. It's important, it's a safety issue. You might have noticed - I really hope you noticed - a major format change to our store this past week. I hope you like it. The goal is to make it easier to drill down from the main menu, through various departments to actual products you might be interested in. More subtle changes are coming in the weeks as the we add in missing images and other things. We might also consolidate some of our menu structure. We have a lot of great products that seem to get buried. Since I'm the guy who does all the programming, I have to fit it all in while I am working on new products, helping customers, and run the business. So it might take a little while to get it all done. Every Friday we have been introducing new products to the store, sometimes fairly mundane stuff, sometimes exciting stuff. This week it was lo-tack spray mount and other stuff. Last week it was winter work gloves and a new tiny Colen Clenton square. Holdfasts are back in stock and we will be bringing several cases of them with us to Woodworking In America. We will also have saws, hardware, books (including the book I mention above), Ashley Iles Bench chisels, and lots of other stuff. Come visit. This year - Finally! - spouses can come along to the Marketplace at no extra admission charge. Saw Vises will be in next week, so I don't think we will have any with us for the show but we can take orders. And before I forget we will have limited quantities of the new Gramercy Tools / TFWW T-Shirt at the show (not on the website yet). I am looking forward to seeing all of you at the show next week, have a safe trip! Note: I complained about the raised platforms a few weeks ago when I wrote about the Renwick Gallery. The National Gallery uses them too. Why don't they just put the furniture on the floor so you can see it at the right scale, and then instead of a raised platform, use a 4" fence around the whole thing. Love the pictures and your perspectives on this furniture. So much fun to follow this blog for tool reasons, and stumble onto your museum visits as well. Regarding the raised platforms. I suspect that these are, to some degree, influenced by the American Disabilities Act. They act as guards that a blind visitor using a cane could follow to avoid stumbling into the objects. Anytime we (I work in a museum) put something out into a space that you could run into in the vertical space, we need to make sure to have a ground level blocking to make sure that cane users can avoid it. I'm sure there are other solutions to this problem, and who knows, these might be entirely an aesthetic choice, but even a fence of some sort would need a floor level guide for the blind. Thanks for the insightful comments. Your museum pieces have brought me back to your blog. It seems to me there is no reason for the platforms except to make it clear these are a display or to provide a demarcation without the typical rope. 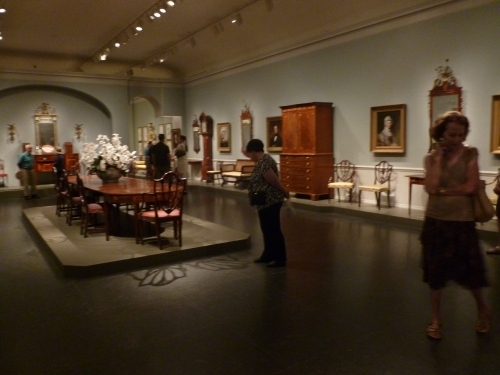 The Yale art museum has an excellent period furniture collection and they have elected to put it all on the floor. Its really nice to be able to get down on your hands and knees close to a piece and study the details. Of course under the eyes of a watchful guard. I look forward to further museum tours. I am sure you have already visited them, I think some of your audience might find Yale (recently renovated), the Yale furniture study and Historic Deerfield's museum. These are smaller museums with some real treats.